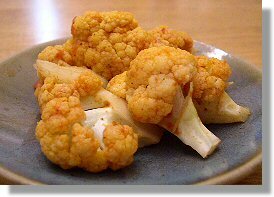 Steam the cauliflower until it is cooked but still crisp (about 5 minutes). Meanwhile, cook the finely chopped garlic in a non-stick pan for a minute or so until it starts to turn golden, but not brown. Add the tomatoes, salt, pepper, paprika and harissa and mix together. Turn the heat down and simmer the sauce for 5 minutes. Add the cauliflower to the sauce, turning it over and allowing it to heat through for 5 minutes or so. If the sauce becomes too thick, add a little water. Kerry, I have a list of Jackson restaurants I’ve tried at http://www.veganconnection.com/Jackson.html. However, since I live on the north side of town, I don’t think I have any listed that would be any closer to I-20 than High Noon. If I hear of anything, I’ll let you know. This looks great. Can’t wait to try it. Also, I am interested to know if you can recommend any places to get vegan food in Jackson or other areas of MS near I-20, as I am traveling this week from Texas to Georgia and have trouble finding anything to eat along the way. I did try a Mediterranean place across the street from the coop last year (High Noon was closed), but it’s pretty far off our route.